Spring has sprung, and with that, another season has ended. I haven't been able to read as much as I would like during the past few months (insert sad face here), but I have read some good ones. According to my Goodreads account, I'm currently seven books behind pace to reach my goal of 60 books by the end of the year. I read a couple of really good ones, and a couple of stinkers this month. And some of them were SUPER long. Game of Thrones: A Song of Ice and Fire by George R. R. Martin ★★★★ If you have never read the Game of Thrones series, you need to. These first two books are the type that I thought about when I wasn't reading them. I actually listened to them as audio books, which I thought was very interesting, as the reader kind of did some voices for the characters. Game of Thrones: A Clash of Kings by George R. R. Martin ★★★1/2 See above. I just am loving this series. Not That Kind of Girl by Lena Dunham ★ I know that this isn't a popular sentiment for this book, but I didn't like it. I thought Lena came off as really self entitled and annoying. While I did have a couple of "Oh, so I'm not the only one" moments, there weren't enough to outweigh the times that I was so freaking annoyed with her. I don't recommend this book. Z: A Novel of Zelda Fitzgerald by Therese Ann Fowler ★★★ 1/2 I was recommended this book by Goodreads, because I like historical fiction. I purchased it on Audible, and I really liked it. I liked this story much better than past books that I've read about similar subjects, such as The Paris Wife. I thought that both Zelda and Scott were very interesting characters, and I'd be interested to learn more about them. Serena by Ron Rash ★★★★ I picked this up on a whim at a thrift store, because I recognized it as the movie that is coming out soon starring Jennifer Lawrence and Bradley Cooper. I started reading it that night, and finished it the next afternoon. It was so good. Serena was such a good character, and the plot was very thrilling. I can't wait to see this in theaters. 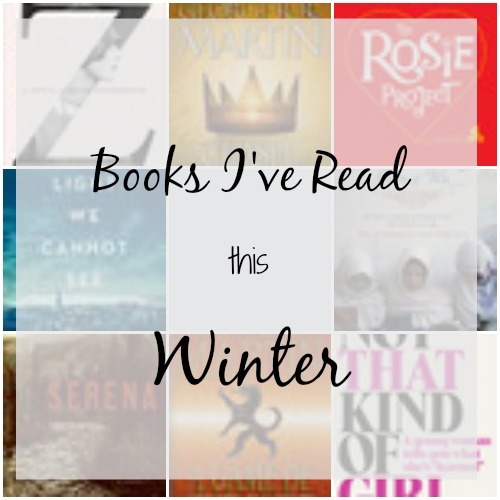 The Rosie Project by Graeme Simsion ★★ 1/2 We read this for Between the Lines in February. This was a cute story, but it was just cute, and I just felt blah about it. Nothing thrilled me, but I didn't hate it. I also left with a lot of questions at the end. Three Cups of Tea: One Man's Mission to Promote Peace... One School at a Time by Greg Mortenson ★ This was another book that I picked up from a thrift store, on a recommendation from a coworker. This was so dry and wordy, that I put it down about 2/3 of the way through. I just could not bear to read 100 more pages (and probably fall asleep). All the Light We Cannot See by Anthony Doerr ★★★ 1/2 This was another Between the Lines pick. I didn't finish it in time for the discussion, but I loved it. I love Doerr's writing style, and how the narration jumps between Warner and Marie-Laure. This is a great coming of age story, told in my favorite genre (historical fiction). I definitely recommend this. If you like to listen to audio books, I recommend that too. Do you have any recommendations for things to help me get back on track with my goal? Any good books you've read lately? The first one is 33 hours, and the second one is 37 hours. I listen to them in the car, and then sometimes at work while I'm writing things. I'm listening to the third one now, and that one is really long. But the story moves. And the cool thing is that if you get the membership to Audible, those books are all one credit, which is 14.95, where you'd have to pay like $40 to buy the audio book somewhere else. I have heard great things about The Rosie Project. I'm surprised you didn't like it! It's not that I didn't like it... I just wasn't thrilled by it. I had just read Serena, and this one just didn't live up to that. I experience that a lot, where the book I read immediately after a really good one falls flat. I hated Lena Dunham's book and by the end of it, I now have a very strong dislike of her to the point I can't watch her on interviews/tv. I agree with the sentiment that most of the book to me she came off very pat herself on the back awesome. I'll have to read Z! I love learning about the Fitzgeralds. I've added the Zelda Fitzgerald Book and Game of Thrones to my goodreads! Thanks for the recommendations! I'm glad I'm not the only one! I could not stand it! I almost struggled with it. I just don't understand. I just kept thinking the whole time, this is not what real life is like. Any time! I love to hear about what others are reading! Oh yeah, Game of Thrones. You have definitely read more than I have. I wish I had more time to read. I wanted to read Z and I'm glad you enjoyed it! I loved The Paris Wife so I'm sure I'll love this, too! And if you didn't like Lena Dunham's book you will probably hate Girls... though I'm not a fan of her personally, I LOVE the show. It's kind of ridiculous but I can relate on many levels. Thanks for the post - my book club is always looking for suggestions! I haven't read any of these!! I'm going through a bit of a memoir phase and read Girl Boss and now am reading Tina Fey's Bossypants. I plan to follow it up with Amy Poehler's 'Yes Please' and then Mindy Kaling's book. I keep feeling like I should add Lena Dunham's book to my list, but just haven't felt a strong desire to read it. I've heard the good, the bad, and everything in between about it, but I just don't think it's for me. I'm sure my curiosity will get the best of me one day though! I LOVED Bossypants and I really liked Mindy Kaling's book too! I need to read Yes Please next. I feel like Lena Dunham's book is worth the read... you never know. Hahaha! I was seriously cringing. And she read the audiobook!! I was driving a far distance for work, and I was getting mad in the car. This was over a couple of months, so don't worry! And I do my best "reading" (listening to audiobooks) when I am driving around in the car for work. Any time! I highly suggest All The Light We Cannot See! There is some really great material for discussion in that. Audiobooks. If you can do it, I highly suggest it. I finished one today while I was doing a mindless task at work. There were some moments in the book that I could relate to. Her growing up and whatnot. I think it's just how she explains things, and the sense of entitlement that she describes things with that gets me. I'm not sure. I've never seen Girls though, I need an HBO GO membership!! I thought I would just let you know... I just ordered Yes Please on audio book, and Amy Poehler reads it herself. I'm only 10 minutes in so far, and it's already hilarious. I never even thought about the audio book! I might have to go that way just to have Amy Poehler read to me haha I'm really looking forward to it now. I'm almost done Bossypants and I've loved it. Thanks! !